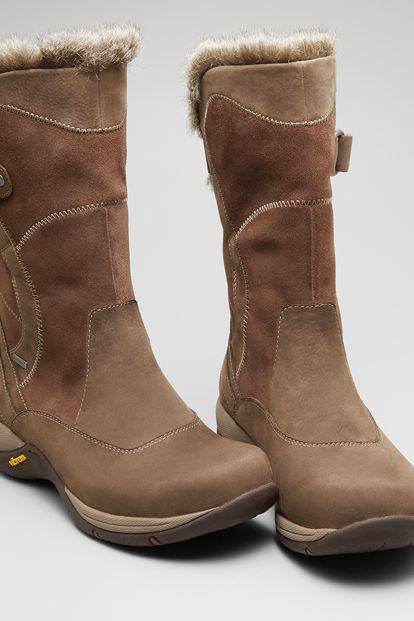 Dansko Boots Now Available at Lucky Feet Shoes! Now available at Lucky Feet Shoes, Dansko’s “Cynthia” is a casual, mid-calf boot with a 1½” heel. It’s loaded with style and engineered for comfort. Ideal for keeping warm as temperatures plummet during fall and winter months, Cynthia’s style grabs attention. But it’s the built-in technology and comfort features that ultimately make this everyday boot a keeper. Cynthia’s upper is made from luxurious, soft suede and milled nubuck leathers. An extra leather overlay–along with a faux fur lining–adds warmth. And the adjustable buckle opening provides a customizable fit around the calf. But what isn’t visible from the outside is the waterproof construction. Aside from the waterproof leathers, a breathable waterproof membrane–and seam sealing–work to keep feet dry. Built for outdoor wear and weather conditions, Cynthia’s waterproof materials help to keep feet dry and comfortable, come rain or shine. High-performance Vibram® technology gives this outdoor boot its durability. Textured waves on the bottom of the outsole work to improve slip resistance. Firmness in the middle of the outsole provides added support for the midfoot, while Cynthia’s cushioned, polyurethane construction improves shock absorption to help protect the feet and body. A built-in shank gives Cynthia stability, while a firm heel counter provides support at the back of the foot. This feature is crucial for those who underpronate or overpronate. That’s because pronation is often the root cause of many foot-related health problems. A fairly common malady, plantar fasciitis is just one of many foot problems that can stem from overpronation. Cynthia’s firm heel counter helps to control the motion of the foot and is crucial to improving or preventing foot conditions related to pronation. 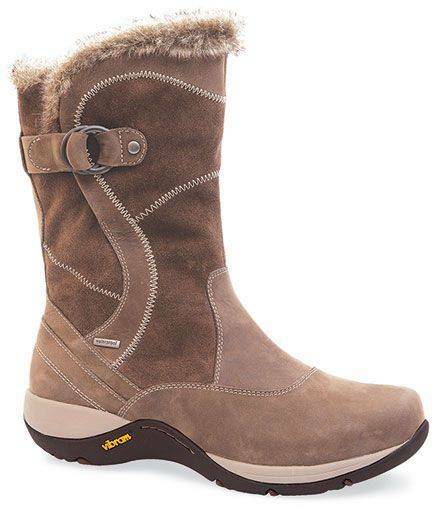 A triple-density EVA, removable, ergonomic footbed provides added comfort to this boot, with ½” of cushioning underfoot. Cushioning makes this boot excellent for those suffering with heel pain or heel spurs. Coupled with the low heel-height, these cushioned arch supports also help those with ball-of-foot conditions like Morton’s neuroma or metatalsargia. Cynthia is suitable for custom orthotics. Just take out the full-length, removable footbed and replace it with a custom orthotic. Adding even more comfort to Dankso’s Cynthia boot is the seam-free lining. It helps to prevent the skin irritation that often accompanies seamed linings. Dansko’s Cynthia also boasts DuPont™ Sorona® fiber moisture management and Cleansport NXT™ odor control that provides a more comfortable wearing experience. You’ll find Dansko’s Cynthia at Lucky Feet Shoes. Stop in today and try on a pair at one of our five locations in Anaheim Hills, Rancho Cucamonga, Riverside, San Dimas or Temecula. Shop Dansko’s Cynthia on our website, where you’ll find the latest in comfort shoes, wide shoes, running shoes, walking shoes and much more!